When asked what would solve traffic problems in their community, 42 percent of Americans say more transit. Only 20 percent say more roads. And 21 percent would like to see communities developed that don’t require so much driving. Two-thirds support local planning that guides new development into existing cities and near public transportation. That’s the result of a new poll released this morning by the Natural Resources Defense Council [PDF]. The national phone survey of 800 Americans was supplemented by smaller surveys to gauge attitudes in the Cleveland region, Philadelphia’s northern suburbs, and Mecklenburg County in North Carolina. The poll follows similar surveys NRDC conducted in 2007 and 2009. Of the national respondents, only about a third had taken transit or a bike any time in the last month, and only two-thirds had ever done so. But even they support local investment in transit by more than a two-to-one margin. While the poll shows transit expansion holding a two-to-one advantage over road expansion as Americans’ preferred congestion-reduction strategy, support for transit is lower than it was in the 2007 version of the same poll. While 42 percent now say traffic should be addressed by building transit, 49 percent answered gave that answer five years ago. And in 2007, 26 percent favored “developing communities where people do not have to drive as much,” a number that’s now shrunk to 21 percent. Support for road-building has more or less held steady at 20 percent. The dip in support for transit and smart growth stems from an increase in people who seemingly can’t make up their minds: Four percent fell into the ambiguous “all/none/don’t know/NA” category in 2007, which doubled to eight percent in 2009 and doubled again to 17 percent now. Lori Weigel, a partner at Public Opinion Strategies, one of the firms that conducted the poll, insisted that this wasn’t a significant change, especially since the category can mean so many different things. Despite a very polarized environment on Capitol Hill when it comes to transit, there’s no pronounced partisan divide in the real world. (See chart above.) Sure, liberal Democrats are nearly five times more likely to want transit than new roads, and conservative Republicans are only 70 percent more likely to want transit – but in the end, they all tend to think transit is the way to go. The same goes for the urban/rural split. 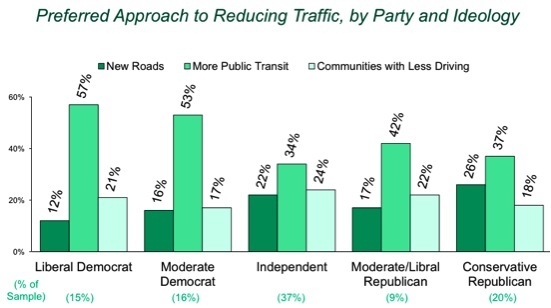 Yes, more big city residents want public transit (50 percent) than new roads (15 percent). But even in rural areas, 36 percent say transit versus 24 percent who want roads. These numbers help explain the overwhelming success of transit ballot initiatives, even when those votes involve a new or increased tax. So far this year, these initiatives have an 89 percent success rate. While Agenda 21 conspiracy theorists believe transit investment and smart growth policies are all an elaborate UN plot, and even the Republican platform now states that Democrats are trying to force us all into “government transit,” this poll gets at the truth. It shows that across the board, most Americans are aware that road-building is not the way to handle growth. It also indicates that there could be significant public support for reforming our highway-skewed transportation policies and restoring sanity to the system, in order to give people the choices they want. Streetsblog and all smart transportation advocates need to crow this article and refer to this survey repeatedly, for a long time. This is very important stuff. Unfortunately, most Americans have moved to places that do require that much driving, and where mass transit would be so inefficient it would be insanely costly and even worse for the environment than driving. They want the government to pay for a taxi to pick them up. Transit and different types of communities go together, and cannot work separately. In the last 25 years, Southern California voters have approved several ballot measures designed to improve transit in general and rail transit in particular. Some cynics have commented that the reason why many voters vote “Yes” is that they figure all those other bozos will be on the train or bus, leaving the freeways wide open for them. The most extraordinary thing in the poll: only 35% of people guessed right when asked what percentage of the state budget went to public transportation. 35% didn’t know and didn’t guess. Yet only 21% of people wanted to the percentage to stay at what it actually is. Everyone else wanted more than what actually exists.. In fact, ballot measures for public transportation routinely pass. Even when they include regressive increases in the sales tax. (I wonder how a measure funded by an income tax on multi-millionaires would do.) Even when they face supermajority requirements (see California). Occasionally they fail, particularly in rural and semi-rural areas, but they pass more often than not. Mixed measures for “roads and transit” do worse (see Atlanta and Seattle). We need more transit in Canada and I think it would be helpful for Americans as well, since it would encourage citizens to walk more and less driving frustrations on the road. Since in the morning there is a lot of traffic and people get angry when they stay in the same spot forever. It would also solve a bit of the issue of obesity, instead of driving from place to place all the time people can take transit and walk to their homes. People can also encourage themselves in a positive light, to take responsibility for their health and the environment around them. Less traffic, less pollution, lesser stress equals better health for Americans and Canadians.